Several of the breakfast items that we had reviewed previously are now discontinued. But several still remain, including the one reviewed below. Like all Amy’s frozen entrees, there were both conventional oven and microwave instructions on this pocket sandwich. Since hunger strikes with vigor, and time is limited in the morning, I opted for the two-minute nuke. Unlike many frozen entrees, the contents seemed to cook up well with the speedy preparation. The pocket itself reminded me more of a thick and bread-y tortilla than a pita pocket, which in my opinion was a tasty bonus. Wrapped neatly around the scramble filling, it was very soft and pliable throughout, with some light cracker-like crisping on the ends once heated. The filling was flavorful, though not flavor injected. Actually, had there been some hot sauce handy, I may have added a dash or two, even with my mild to medium taste buds. The scramble looked quite a bit like eggs with a relatively similar taste and texture to boot. However, I preferred this tofu mixture to eggs. It tasted better, and didn’t turn gummy when it cooled. The package notes that this pocket is made with organic shiitake mushrooms and red bell peppers, and I can vouch that it is. These weren’t little bites, but actual slices of shiitake throughout and a good smattering of diced bell peppers. I enjoyed this product, and wouldn’t hesitate to eat it again. But since I’m not a scrambled egg fan, there are other Amy’s products that address my cravings a bit better. Ingredients – tofu (filtered water, organic soybeans, nigari[magnesium chloride, a natural firming agent]), organic wheat flour with organic oat bran and wheat germ, organic onions, filtered water, organic bell peppers, organic shiitake mushrooms, organic tomatoes, organic extra virgin olive oil, organic broccoli, sea salt, organic high oleic safflower and/ or sunflower oil, organic evaporated cane juice, organic tamari, organic jalapeno peppers, yeast, spices, tumeric. contains soy and wheat. 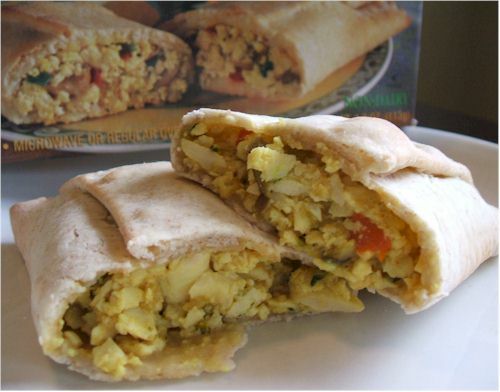 Certifications: The vegan varieties of Amy’s Breakfast Entrees are Certified Vegan. Dietary Notes: By ingredients, the vegan varieties of Amy’s Breakfast Entrees are dairy-free / non-dairy, egg-free, peanut-free, vegan / plant-based, and vegetarian. Select varieties are nut-free, soy-free, and/or gluten-free. Nonetheless, check with the company on their manufacturing processes for all varieties if potential allergen cross-contamination is an issue for you. Processes and labeling are subject to change at any time for any company / product.